ENGINEERING. PRACTICE. POLICY. 27 February/March 2018 unmanned systems inside L AS VEGAS—While driverless cars may not always have had a place at the annual Consumer Electronics Show, the times they have a changed. 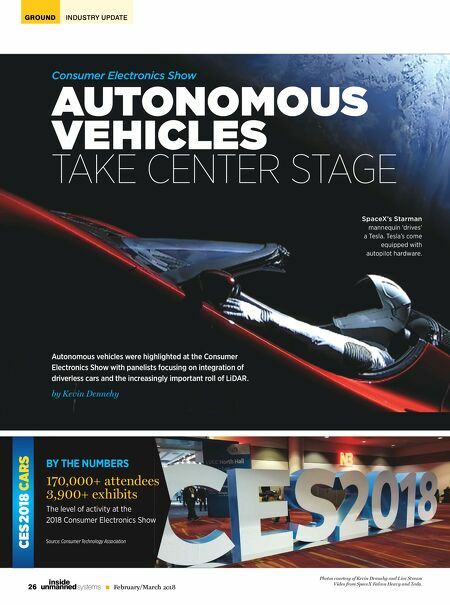 At the recent CES in Las Vegas, several displays, workshops, demonstrations and discussions focused on autonomous vehicles, the sensor in- novations that make them possible and many of the manufacturers' partnerships and plans to bring driverless cars to more places around the world. 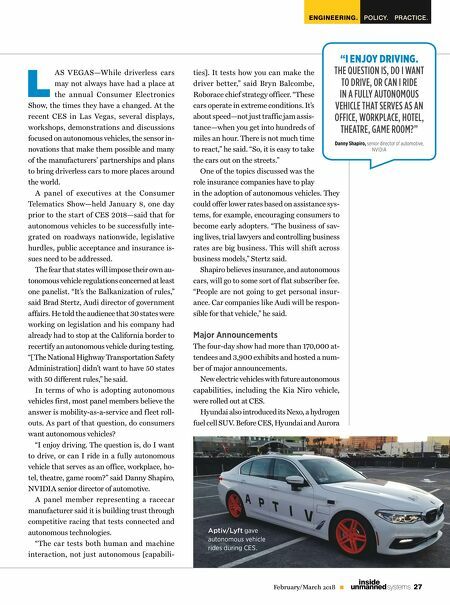 A panel of executives at the Consumer Telematics Show—held January 8, one day prior to the start of CES 2018—said that for autonomous vehicles to be successfully inte- grated on roadways nationwide, legislative hurdles, public acceptance and insurance is- sues need to be addressed. The fear that states will impose their own au- tonomous vehicle regulations concerned at least one panelist. "It's the Balkanization of rules," said Brad Stertz, Audi director of government affairs. He told the audience that 30 states were working on legislation and his company had already had to stop at the California border to recertify an autonomous vehicle during testing. "[The National Highway Transportation Safety Administration] didn't want to have 50 states with 50 different rules," he said. In terms of who is adopting autonomous vehicles first, most panel members believe the answer is mobility-as-a-service and f leet roll- outs. As part of that question, do consumers want autonomous vehicles? "I enjoy driving. The question is, do I want to drive, or can I ride in a fully autonomous vehicle that serves as an office, workplace, ho- tel, theatre, game room?" said Danny Shapiro, NVIDIA senior director of automotive. A panel member representing a racecar manufacturer said it is building trust through competitive racing that tests connected and autonomous technologies. "The car tests both human and machine interaction, not just autonomous [capabili- ties]. It tests how you can make the driver better," said Bryn Balcombe, Roborace chief strategy officer. "These cars operate in extreme conditions. It's about speed—not just traffic jam assis- tance—when you get into hundreds of miles an hour. There is not much time to react," he said. "So, it is easy to take the cars out on the streets." One of the topics discussed was the role insurance companies have to play in the adoption of autonomous vehicles. They could offer lower rates based on assistance sys- tems, for example, encouraging consumers to become early adopters. "The business of sav- ing lives, trial lawyers and controlling business rates are big business. This will shift across business models," Stertz said. Shapiro believes insurance, and autonomous cars, will go to some sort of f lat subscriber fee. "People are not going to get personal insur- ance. Car companies like Audi will be respon- sible for that vehicle," he said. Major Announcements The four-day show had more than 170,000 at- tendees and 3,900 exhibits and hosted a num- ber of major announcements. New electric vehicles with future autonomous capabilities, including the Kia Niro vehicle, were rolled out at CES. Hyundai also introduced its Nexo, a hydrogen fuel cell SUV. Before CES, Hyundai and Aurora "I ENJOY DRIVING. THE QUESTION IS, DO I WANT TO DRIVE, OR CAN I RIDE IN A FULLY AUTONOMOUS VEHICLE THAT SERVES AS AN OFFICE, WORKPLACE, HOTEL, THEATRE, GAME ROOM?" Danny Shapiro, senior director of automotive, NVIDIA Aptiv/Lyft gave autonomous vehicle rides during CES.